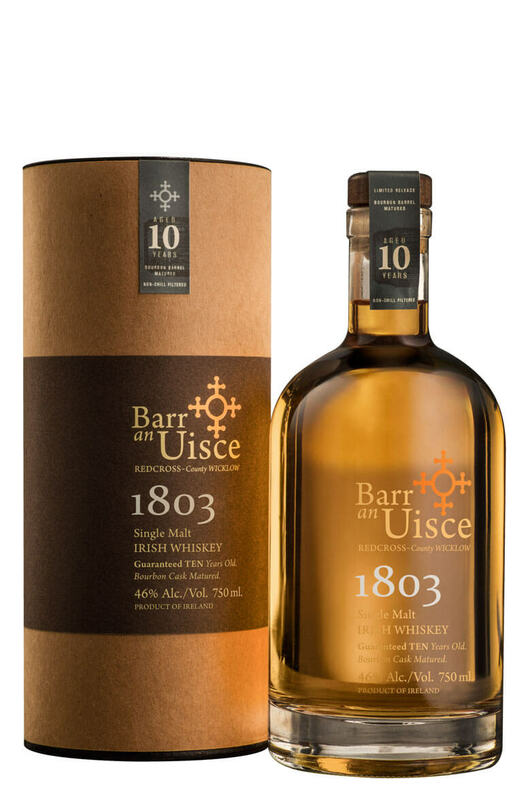 The '1803' is a 10 year old single malt matured entirely in first-fill American Bourbon barrels and cut using fresh water from a family well in County Wicklow. Redcross, has an interesting history. It was a major stopping point for horse and carts travelling from southern Ireland to Dublin. People who travelled along the East Coast of Ireland found themselves in Redcross. It became a meeting point for gossip, news ,culture and music. The village of Redcross and the town land of Barraniskey were both affected by the penal laws many years ago and in 1803 the Barraniskey church was built. The copper coloured Cross still stands in the graveyard in Redcross to this day. This copper cross was the inspiration for our Logo. Taste The palate is chewy and mouth-filling with fresh oak and spice to the fore. Flavours of preserved apples and pears, wood shavings, ginger, vanilla, toasty oak, lemon and orange peel. Nose Initial aromas of fresh orchard fruits combined with rich vanilla and crème brulee notes. These are followed by richer, warmer touches of candied citrus, sultanas and ginger spice. Types of Barrel used for Aging First-fill ex-Bourbon barrels.